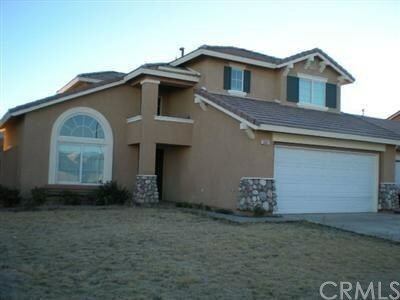 Lovely 2 story 4 bedrooms 3 bathrooms home in the city of Victorville walking distance from schools and park. This home is located in a central location near shopping centers and freeway with sidewalks and paved roads. The home welcomes you with a formal living room with a cozy fireplace and formal dining room. The kitchen is spacious with many cabinets, a breakfast nook area and a sliding door to a impressive backyard. The shed is included with the sale. Thereâs a bedroom downstairs with a bathroom. The stairs leading to the master bedroom suite features a separate soaking tub and shower, double sink vanity and walk-in closet. Wait there 2 more bedrooms and a bathroom with a shower and tub combo upstairs. The laundry room is also found upstairs. The garage is fully finished with a utility door access to the side of the home. Large backyard with a huge shed.